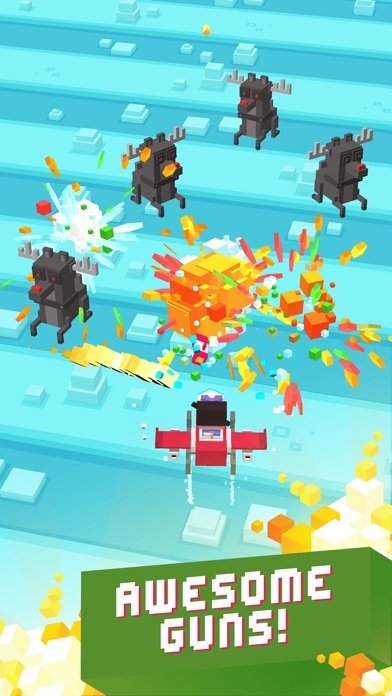 Discussion in 'iPhone and iPad Games' started by TouchArcade Bot, Sep 30, 2015. 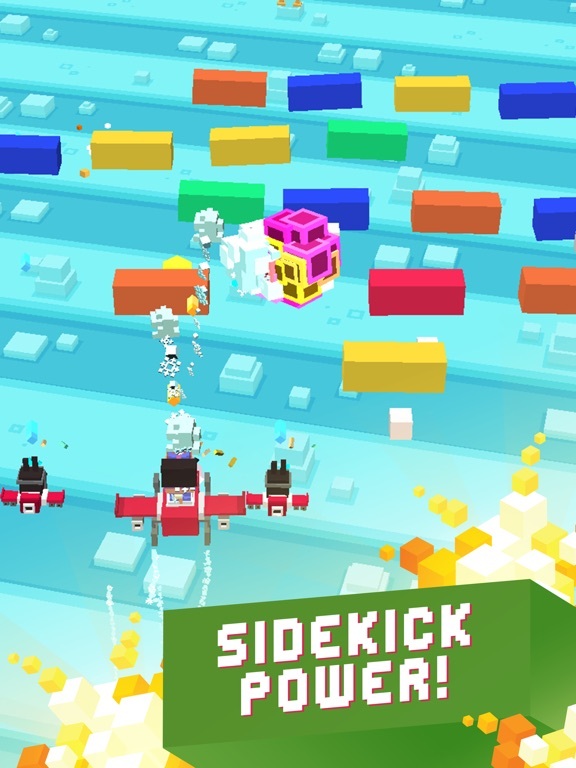 Dodge the bullets, shoot the enemies, defeat the bosses! 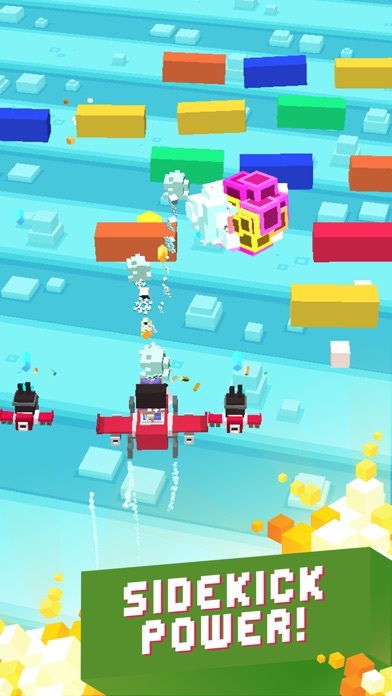 Take to the skies for an endless-arcade shooter that is fast, furious and formidable! Collect over 200 daring pilots over 20 different terrains. Change the intensity from Scouty to Screamy, if you dare! Earn a multitude of achievements Challenging daily missions Guns! Missiles! Badgers! Get flying now! Way better than CR, imo. Very fun. Way better than CR, imp. Very fun. Agreed so far. I'm just a bit confused. Why is the developer not shown as hipster whale? What did a bunch of them leave and make their own company? Just like with land sliders too? Really, really polished. 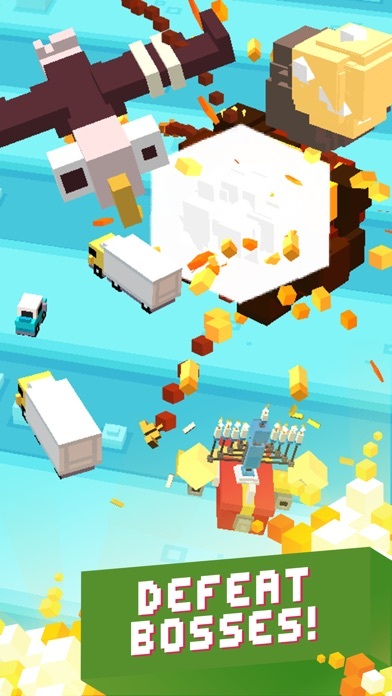 Doesn't even feel like a FTP - more like a bullet hell shooter, since it starts intensely immediately. There's even a second control mechanism of not moving to charge a power shot. 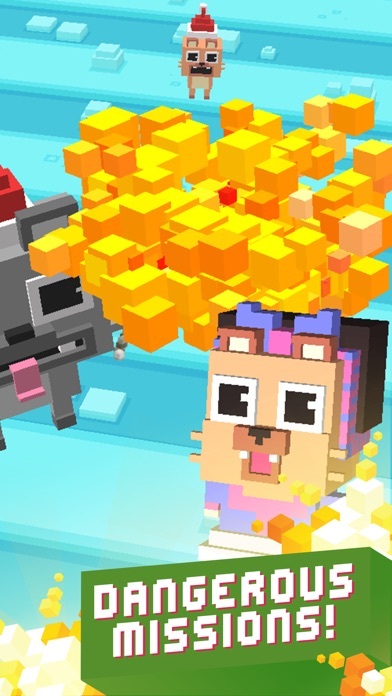 On the other hand the monetization will probably work really well, since there's a real incentive to continue (use coins or watch a video), as there's actual variety to the enemies and their patterns. And nope. I spent coins on a weapon and it expires in 2 hours? That pisses me off. Disappointing. I won't be watching any ads nor spending a dime. No way. 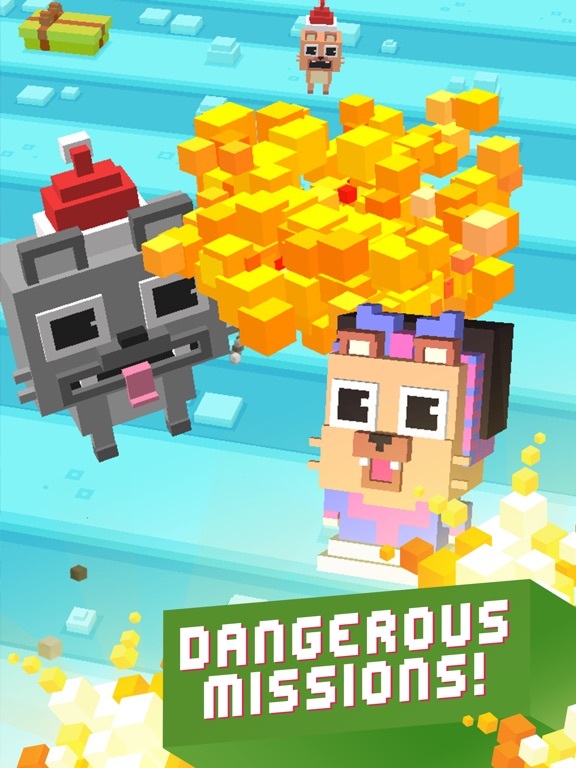 Who the hell are <Mighty Games>?! Heya, this is Matt from Hipster Whale. So Mighty Games was formed a little while back now by me, Ben Britten and Matt Ditton. More recently Andy joined the fold as the 4th director. We also have a bunch of lovely people working for us too, so it's not really just "Hipster Whale" on this one. Hope that clears things up a bit! 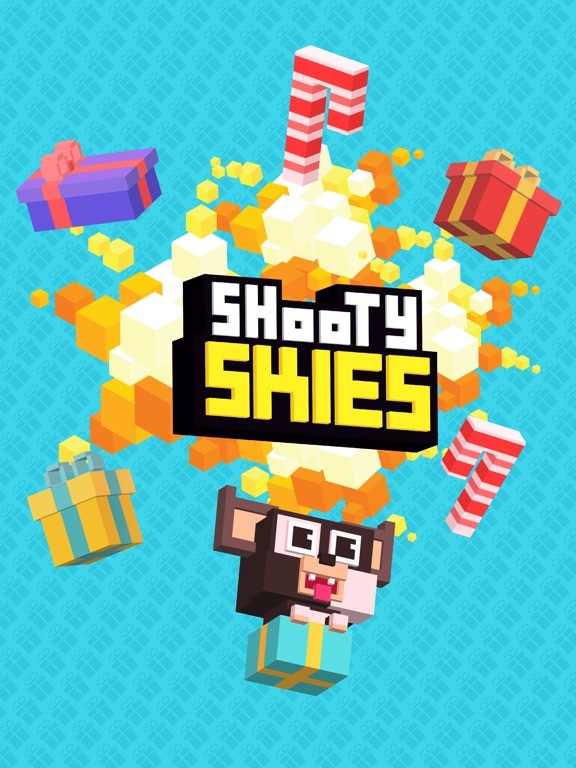 Oh and, here's the Shooty Skies trailer! There's a second progression metric besides coins, which AFAIK behave exactly like coins in Crossy Road. It's more of a playtime meter that opens a mystery box when filled. I've received both a consumable buff and coins from the box. [Edit] Okay, now I see the menu for purchasing buffs. There's no indication that they are not permanent either. That said, the first two are available through ads. Maybe the third too (the one I got from the mystery box). The other two are 1.5x and 2x the cost of a new character, so I assume they are beefy. So in the end I think they're fair, but there should be some text that says how long they last (maybe they're all 2 hours like the 2 I currently have).
? 'z ^ witcha m'Lord Matt. Great Shooty Up so far. I'm having fun with it. I like the Charge Special. 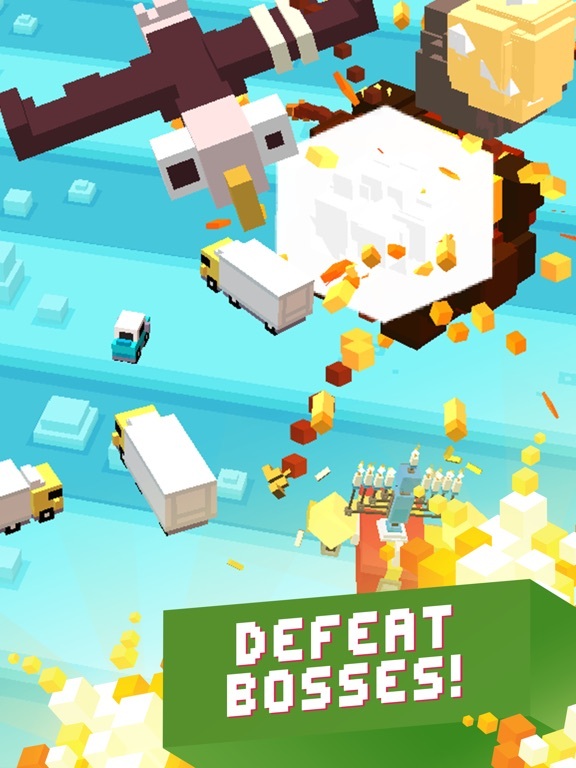 #Congratulations to you & your Mighty Games Team on your new release# i would like to know if you would implement Everyplay, Kamcord or ReplayKit? Sweet! Downloading now. I saw this on Twitter not too long ago and was pleasantly surprised to see it at the top of the hot games section when I opened the TA app. Gotta go to bed now but can't wait to load it up in the AM! Hi it's Tim from Mighty. Love the feedback and thoughts. We wanted to make sure there was a bit of something for everyone. If you like to hold onto your coins to unlock our characters you can get some bonus goodies through playing and racking up points, but if you want to spend some coins on a boost to jump in a little hotter, you can do that too. Hope you're enjoying your time in the Skies. That's ridiculous. It takes about 1.5 minutes to earn 200 coins, and you unlock a weapon that quadruples your power for 2 hours. How is that bad? You think you should play for 90 seconds and unlock the best weapon in the game for use forever? That's good game balancing? This game is fantastic in my brief time with it. 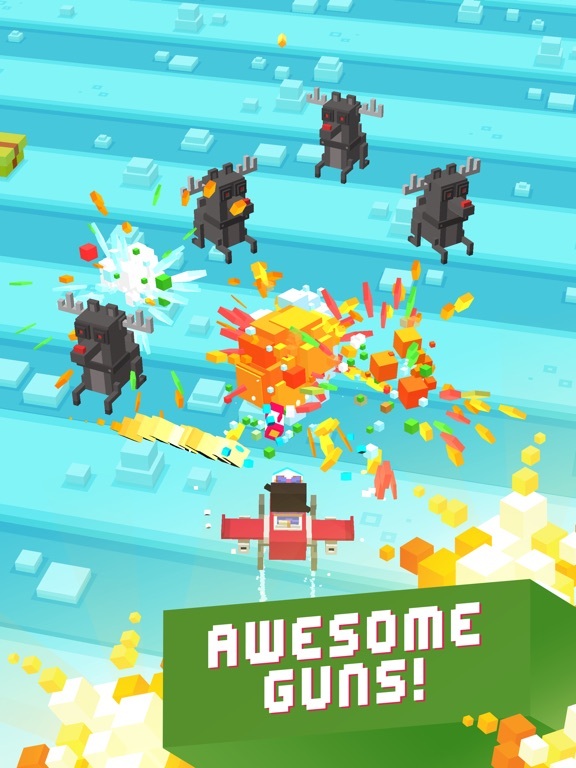 I really enjoy this - much better than Crossy Road. Very fun undeed. Really loving this game however i wish it had Relative Touch controls instead of a high-speed Touch-Follow. 90% of my deaths are caused by the ship moving towards my finger behind it when i intend to move forward instead to avoid a bullet underneath the ship. The problem is that i am accustomed to having my finger in other shmups about 3/4ths of an inch behind the ship's hit-spot on the ipad air. And here the ship locks itself to about half an inch (maybe less) on the ipad air. So when i touch the spot to where im accustomed at, the ship unnecessarily moves downward first. With the mechanics of the power shot that requires you to lift the finger, it just causes almost all of my game overs. Nice surprise, wasn't expecting this until tomorrow night! Great game so far, I hope it has enough variety to keep me coming back! Not ridiculous. What I'm trying to say is it doesn't say it anywhere. So I got disappointed. Is the game fun? Heck yea. Is it worth the $5 purchase. I most likely will. I prefer to spend money in games I enjoy. But that's not the issue. Also my other issue is I looked in the options and I don't see anywhere to activate relative touch controls or atleast a slider for the distance the character is from the finger touch point. Hopefully that can be addressed as well. So much fun so far. Hate the pay to continue screen, even though you can tap to speed through it. I agree about the controls feeling a bit laggy, but it's something I got used to just fine after a half hour or so. A slider sounds like a good idea. We'll have a play with it. Really enjoying it. My only complaint is that it's sometimes difficult to see those yellow enemy shots when there are a lot of explosions going on. Also, it's not super clear where and how large the hitbox is for your ship. I'm assuming it's basically where the glowing blue charge shot is. While relative touch would be ideal, the current controls are responsive enough that I'm not turned away. Wow! I really love this game. I downloaded it and could not stop playing for a whole hour! 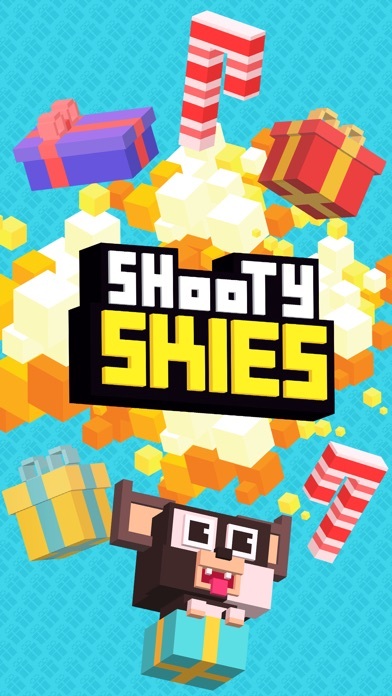 It's just a very fun, casual take of the shmup-type genre. Favorite one in a while.